Preparing For Our Children's Future: "Watercolors by Arlene Faye" Etsy Shop Review & Giveaway!! "Watercolors by Arlene Faye" Etsy Shop Review & Giveaway!! I think I was born about a century late. I love the good old days. The stories, the pictures and the lifestyle. I love antiques, and want to pass on the "old things" and "old ways" to my children and grandchildren! A while back when I was "shopping around" on Etsy, a watercolor painting popped up and I went to check out "Watercolors by Arlene Faye"! I Just Love her paintings! It is hard to say which painting would be my favorite, but I love laundry hanging out to dry, so the "Laundry day" painting would be high on my list! After visiting "Watercolors By Arlene Faye" you will soon see that she has a wide variety of paintings and you can find a painting that will fit in every room of the house! And you can pick from Original watercolors or prints! The "I CAN REACH THAT" Giraffe would be great for a children's room! I know my girls would Love it! 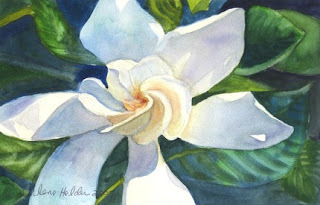 I love the "Sweet Gardenia"! Isn't it breath-taking?! 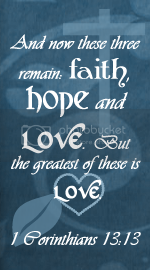 I would have this on a bedroom wall too! I love cherries! 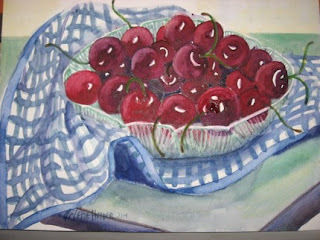 And I think the "Life Is A Bowl of Cherries" painting will make you hungry for a fresh cherry or cherry pie! =) YUM! They look so shiny and real! 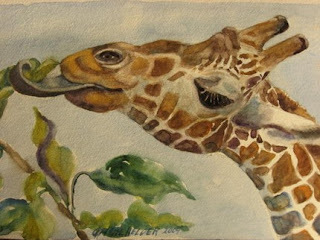 "Watercolors by Arlene Faye" would make great gifts! I would get several of them for Christmas gifts! Or maybe you would rather give watercolor painting notecards? She has a lot of them too! She has a lot of great winter scene paintings on notecards! 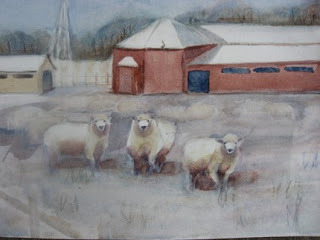 Including these "Sheep in Winter" (below)! And watercolor cards that will be great for Christmas cards! There are a lot of them to choose from! 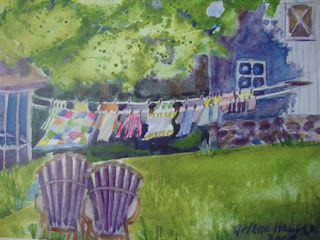 Just visit "Watercolors By Arlene Faye" to see them all! 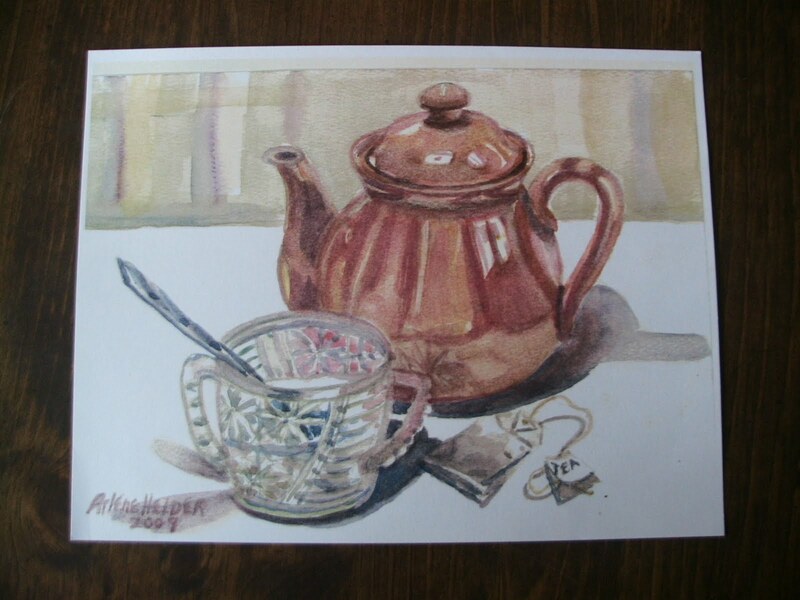 I have a print of the "Vintage Pink Teapot" from "Watercolors by Arlene Faye", and I am so excited about it! It is like having a rare treasure to me! When I first got it, I had thought about giving it to someone special for a gift, but I think I am going to keep it for our family and pass it on to our girls! I love tea and teapots and as I said before, vintage items! Plus I think this will look really good on the cedar walls in the kitchen! Maybe someday I will have a dining room and can hang it up in there! Visit "Watercolors By Arlene Faye" and let me know which one you love or bought! "Watercolors by Arlene Faye" is offering one of my blog readers the choice between two of her prints! A Big thank you to Arlene! One winner will get to choose the 8x10" print of the "Life Is A Bowl Of Cherries" or an 8x10" print of "Laundry Day"! Visit "Watercolors By Arlene Faye" and tell me another original, print or set of cards you would love to buy for you and your family, or give as a gift! Mandatory entry must be done to enter giveaway! That gives you 26+ chances to win! Have fun! This giveaway is open to the U.S. Only and Ends on Oct 23 rd at 12 am central. The winner will be chosen at random using random.org. 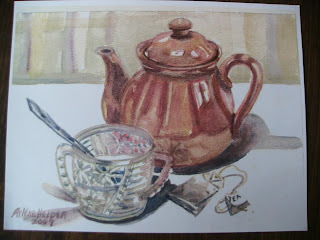 The prize will be sent directly from "Watercolors by Arlene Faye" to the winner. For purposes of this review, I received a sample to review. The views and opinions expressed on this blog are purely the bloggers' own. I would love the Pink and Tall Original Tulip Watercolor Painting for myself! I would chose Laundry Day if I won. 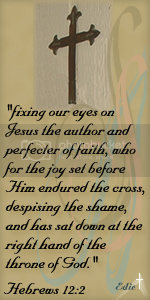 I entered you Moja Creations giveaway. I love the Red Geranium and White Petunias Original Watercolor by ArleneFaye. Thanks for the chance! I'd choose the Laundry Day print. Moja Creations Review & Giveaway! Girl's Romper Pattern Review and Giveaway!!!! I 'm Back! So Sorry for the absence!